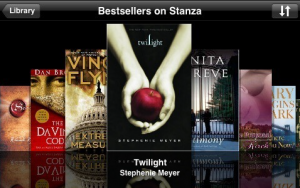 Amazon buys Stanza, iPhone ebook reader. Amazon has tightened it’s grip in the eBook market this week by aquiring Stanza, the popular iPhone App from Lexcycle. Obviously Amazon is wanting to gain eBook customers among the millions of iPhone users that have already begun to see the iPhone as a superior eBook reader to Amazon’s own Kindle. Lexcycle’s Stanza is one of the most popular iPhone Apps with reportedly over a million downloads and around 100,000 eBooks available from their providers, many for free. “We are not planning any changes in the Stanza application or user experience as a result of the acquisition. Customers will still be able to browse, buy, and read ebooks from our many content partners. We are excited to join forces with a company that has innovated on behalf of readers for over a decade and is a pioneer in eBooks.” Reads the site’s blog. Perhaps this is a step in the right direction, instead of Amazon thinking of the iPhone as a competitor, it’s starting to think of it as a platform. Details on how this acquisition will effect future additions to the Stanza library, as Amazon’s eBook format is not DRM free, or if this is simply a move to try and corner the market. Between Stanza and the Kindle iPhone App, is there any thing stopping Amazon from being king of the eBook?